The Barcelona ICP1 course in mid June was the final of 3 certification courses conducted in Spain and as usual, an intense weekend of learning to skate and teach ensued. 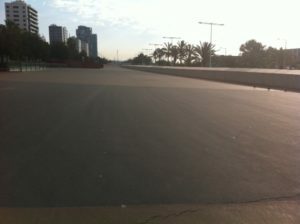 Barcelona is a skating city. They have a thriving Friday night skate with 500 people all summer, miles of smooth bike lanes all over the city and superb seafront promenades along the beaches all ideal for skating. The recent ICP level 1 course (14-16 June) was originally requested by the association who organise the FNS here; patinarbarcelona (http://www.patinarbcn.org/and Facebook ‘APB a Patinar Barcelona’). Their extensive group of 70+ marshals has always given free skate lessons to help promote their FNS (just like Skatefresh did in the early years of the Wednesday night skate in London). 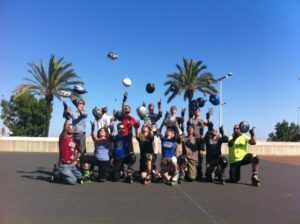 Patinar Barcelona put in 9 skaters onto the course and the other 5 places were filled with other skaters including 2 from Mallorca and one from Portugal. The weather was extremely hot and sunny throughout the weekend and I was surprised the tarmac wasn’t melting. We had no shade so there were frequent sun cream and water breaks although on Sunday a canopy was procured to shade the skaters waiting for their exams. 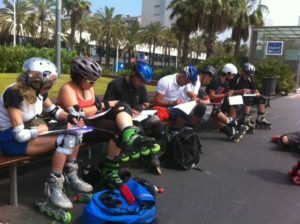 I had a gruelling 6 hours under the sun marking teaching exams and then almost 3 hours examining skate skills. This course was interesting as the majority of the candidates had taught before but this can cause issues with established habits and practices needing to be adjusted to match the ICP criteria. For example in Barcelona a Ready position is much wider than ICP’s hip width and for some this was tricky to change. Class handling with small groups was also at times troublesome as the groups they normally teach can reach 60+ people. Makes me realise how hard it can be for any of us to change anything but also how flexibility in practice is a virtue that allows you to gain in any situation. I am informed that the ICP methods are already being put into practice and it seems that another ICP course could happen in Barcelona later this year. I will be very happy to return to this wonderful city where I spent over 2 very fine weeks. Congratulations to the successful candidates and I look forward to the retests later this year. This course in Barcelona completes my tour of Spain and a total of 3 Level 1 courses within a month. It has been intense but fun and very satisfying to work with so many dedicated skaters. 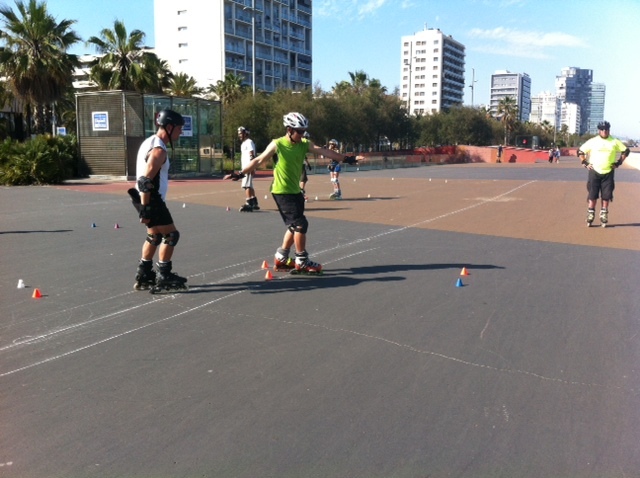 Skating in Spain is booming and I am happy to be ridding that wave! Aprovechamos!